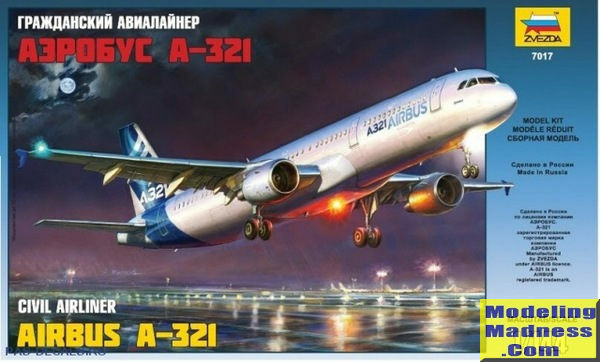 The Airbus A321 is a member of the Airbus A320 family of short- to medium-range, narrow-body, commercial passenger twin-engine jet airliners manufactured by Airbus. It was the first derivative of the baseline Airbus A320 aircraft, and carries up to 236 passengers with a maximum range of 3,200 nmi (5,900 km; 3,700 mi). Final assembly of the aircraft takes place in Hamburg, Germany or Mobile, Alabama in the US. The A321 is a stretched-fuselage variant of the Airbus A320 and entered service in 1994 with Lufthansa, around six years after the original A320. The aircraft shares a common type rating with all other Airbus A320 family variants, allowing existing A320 family pilots to fly the aircraft without the need for further training. In December 2010, Airbus announced a new generation of the A320 family, the A320neo (new engine option). The similarly lengthened fuselage A321neo variant offers new, more efficient engines, combined with airframe improvements and the addition of winglets, named Sharklets by Airbus. The aircraft will deliver fuel savings of up to 15%. As of 30 September 2017, a total of 1,570 Airbus A321 aircraft have been delivered, of which 1,551 are in service. In addition, another 1,701 airliners are on firm order (comprising 231 A321ceo and 1,470 A321neo). As of September 2017, American Airlines was the largest operator of the Airbus A321, operating 219 aircraft. Zvezda is one of those companies that has a wide range of plastic models and it does a nice selection of airliners. Most of what is done has ties to Russian civil aviation, but this one is a bit different in that it provides markings only for the demonstrator. This is not really an issue for many of us as there are plenty of aftermarket options. 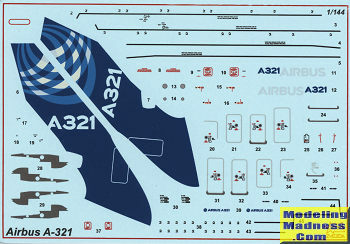 As a note, since this kit does not have the winglets, it is not a 321 neo. Detailing is very good and the kit comes with a number of nice features. It has a cockpit with two seats and an instrument panel. There is the area behind the cockpit where one enters the plane that has some nice detail. This is because, like ancient Airfix kits, the main entry door is a separate item and is provided a piece so it can be displayed open. The kit can be built one of three ways; in flight, on the ground or in a landing attitude. For the third option, you have separate slats and the flaps can be posed lowered. To do the in flight option, the flaps need to have the attachment points cut away. Different flap actuator housing bits are provided. 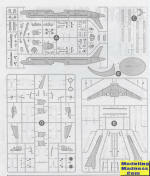 Of course this also means that you can build the kit with the gear up and for that there are different gear door pieces. The landing gear are very nicely done and have separate wheels, so grab your magnifier when it comes time for painting. Let me backtrack a bit. The fuselage is not smooth. All the windows are open and you have strips of windows to install, just like on the aforementioned Airfix kits. 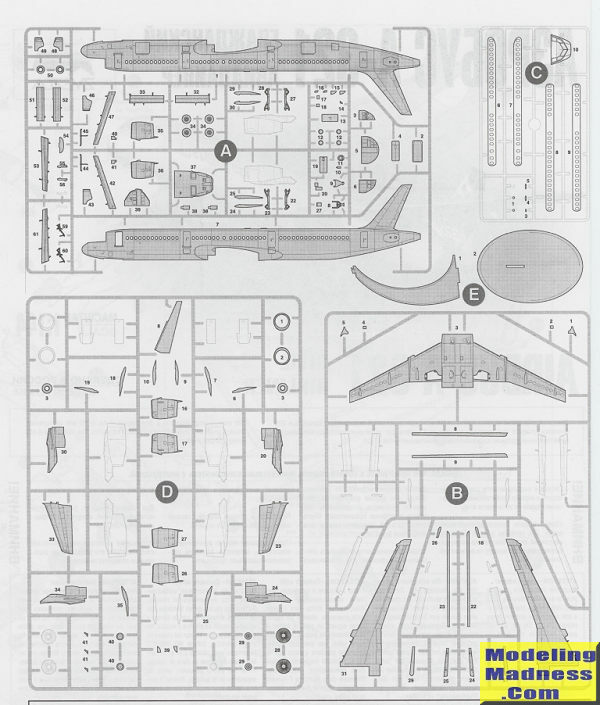 This feature alone can cause issues when it comes to painting as it basically means you have to paint the fuselage halves before assembling them unless you want to mask dozens of tiny windows. This also may well make using aftermarket decals difficult without filling in all those dozens of tiny windows so you can use the window decals that often come with them. This feature is undoubtedly had some bearing on why Zvezda picked the markings option it did. In case you can't tell, I'd rather have a smooth sided airliner kit, though there are an equal number who would not. Engines are nicely done and while the cowlings are split into left and right halves, a one-piece forward section is provided. I see that there are alternate engines so you can use whatever is appropriate for the livery you choose. There is no indication on how much nose weight will be needed if building the 'on the ground' option, but I'll bet it is considerable. Fortunately, there is a lot of room for it. Instructions are well done and provide both generic and Humbrol paint references. The single markings options is pretty much overall white with grey upper main wing interiors. You get some of the very dark grey bits for the engine pylons and the usual stencils and wing walk stripes. I am not sure how good Zvezda decals might be, but in this day and age I'd like to think they are quite good. This should make a nice addition to any airliner collection. It is not a small plane, being around the size of the 757-200 so it will need some shelf space. I'm pleased that Zvezda includes a display stand as this really helps to make good use of shelf area if things are getting a bit full.